*This post is sponsored by Sabra for National Hummus Day. All content and opinions are always my own. One would think that life without children means we have all the time in the world to bake, garden, read, lounge, visit family or other various and sundry activities; however, mid-life is proving to be full which means we’re very fortunate – and we’re going to enjoy every single moment. The Professor began teaching his summer class this week and I’m co-facilitating art journaling workshops with another life coach; we’ve had a few days to clear out our garden beds, the outdoor furniture has been uncovered in anticipation of summer and we’re headed to Philadelphia soon to see a niece graduate from college. Thankfully, meals these days are simple; one of the nice things about having a tub or two of hummus on hand is that it’s quick to pull a soup, salad or quick bite together. 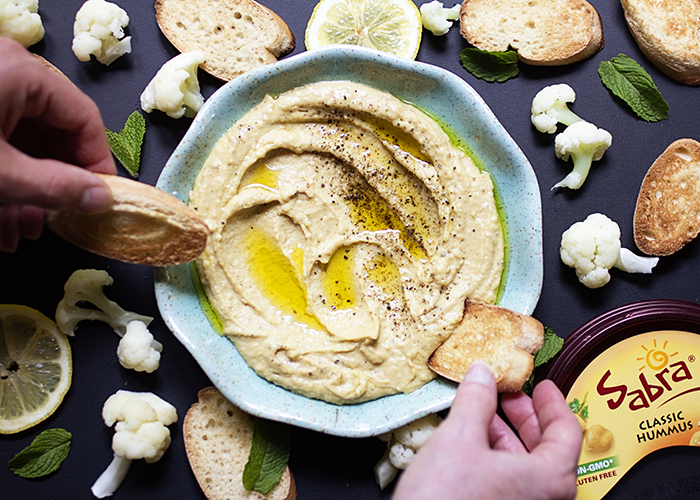 This Black Pepper Hummus dip is both vegan and vegetarian, it’s also plant-based which means it’s also healthy – but what I really love is that the dip comes together quickly, is great as an afternoon snack or can be enjoyed as a nibble while supper is being prepped. 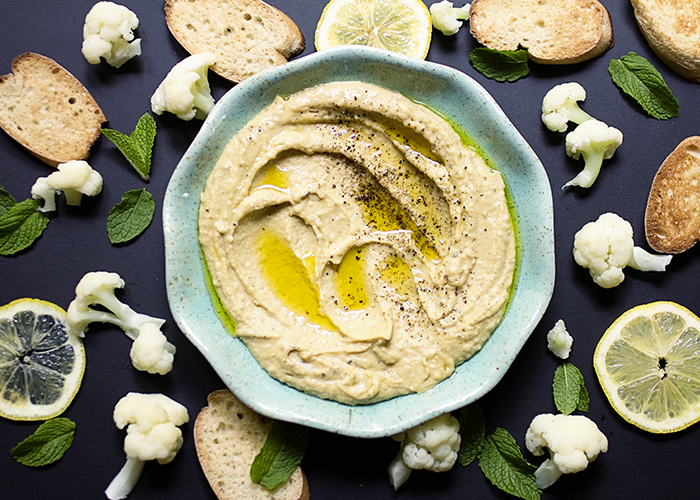 I’ve used Classic Hummus as a base, added a squeeze of lemon, a bit of lemon zest, a drizzle of olive oil and several cracks of black pepper; spread on toasted crostini, add cauliflower and top with fresh mint. But you could swap out classic for Lemon Twist, Garlic, Supremely Spicy or other hummus flavors found at Sabra.com. In a quick, non-scientific poll of friends, I happen to know that they do love their dips; National Hummus Day is Saturday, May 13th and this dip would make a great, un-official meal! 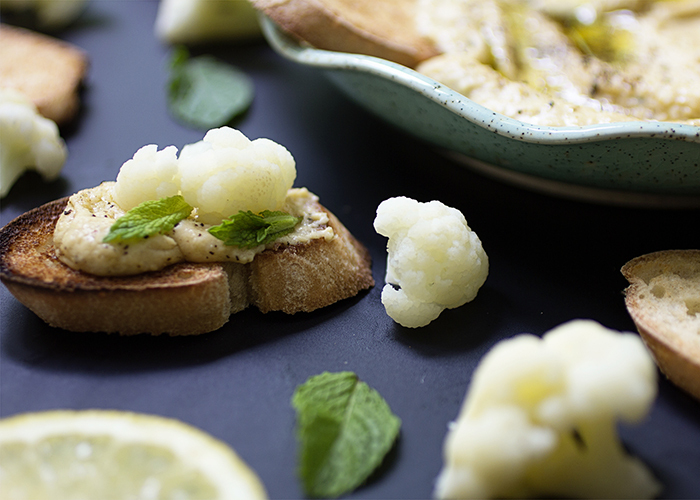 Spread the dip on the crostini, add small chunks of cauliflower and top with mint. Or you can layer the cauliflower and mint on top of the hummus dip and serve family style!